Iraq Leftovers Invading the USA? Coming soon to your local sheriff: 18-ton, armor-protected military fighting vehicles with gun turrets and bulletproof glass that were once the U.S. answer to roadside bombs during the Iraq war. The hulking vehicles, built for about $500,000 each at the height of the war, are among the biggest pieces of equipment that the Defense Department is giving to law enforcement agencies under a national military surplus program. For police and sheriff’s departments, which have scooped up 165 of the mine-resistant ambush-protected vehicles, or MRAPS, since they became available this summer, the price and the ability to deliver shock and awe while serving warrants or dealing with hostage standoffs was just too good to pass up. “It’s armored. It’s heavy. It’s intimidating. And it’s free,” said Albany County Sheriff Craig Apple, among five county sheriff’s departments and three other police agencies in New York that have taken delivery of an MRAP. I like this quotation from Ron Paul. 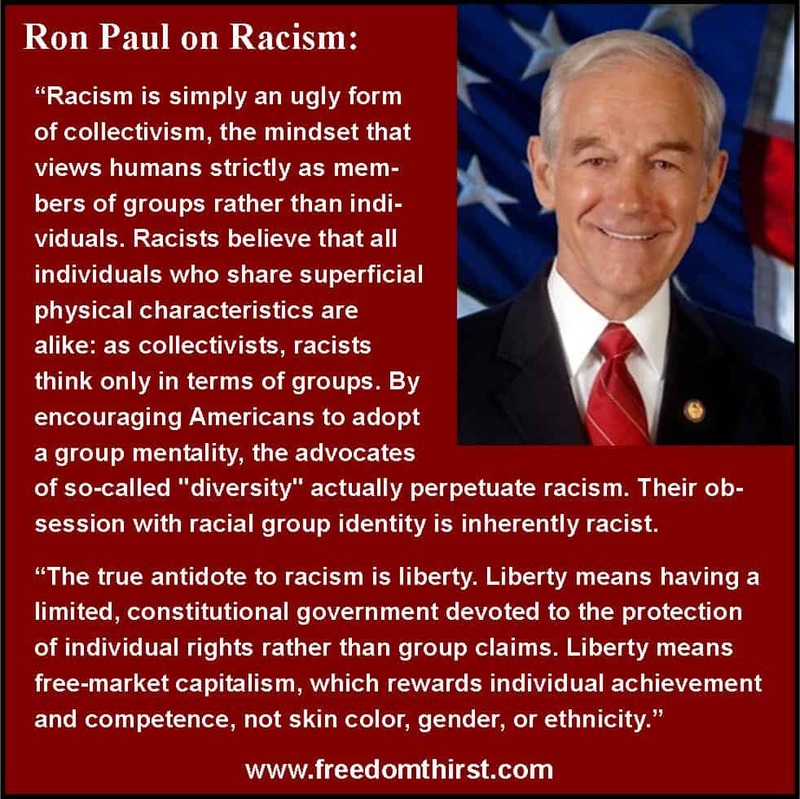 He is basically saying that liberty and respect for the individual are the answer to racism, not big statist government schemes. Nero fiddled while Rome burned. It is so easy to get caught up in trivia and miss focusing upon the critical thing(s). If we go into hyper-inflation and trucks and trains no longer deliver goods, we wonâ€™t even be able to buy condoms! The critical focus of the current issue — The president does not have the authority to dictate what can be supplied by stores or insurance companies. His authority and that of his administration is limited by the U.S. Constitution. The members of Congress and the Supreme Court are failing in their oaths to protect and preserve that Constitution by not yanking on his leash! One authoritative step outside those limits becomes tyranny. 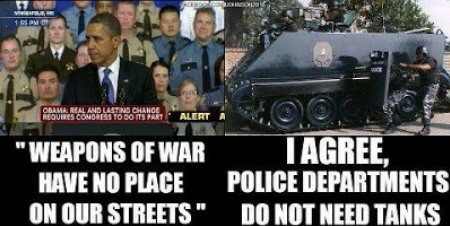 Accepting such tyranny makes slaves of free men. He was â€œhiredâ€ to work within the predefined limits of the job. The Tea Party freshmen elected in 2010 were not given a vote in their congressional leadership (Speaker John Bohner). Yet he took office because of the majority they created. As a result, they were â€œneuteredâ€ in many respects, by politicians more interested in status quo than â€œsudden and relentless reform!â€ ( To quote Gov. Sarah Palin). Many folks say they are tired of â€œendless political bickering.â€ It appears to me they, and most bickering politicians, miss the critical point. America is in the final stages of a decades-long battle between liberty and slavery. Forget â€œPolitics is the art of compromiseâ€. Liberty and slavery cannot exist at the same time! There is no compromise with slavery! John Locke had a profound impact upon America, as Colonial pastors preached the truths in his writings. The earth is a stage, upon which God has placed man, to act out his destiny. If you were the only one on the â€œstageâ€, you would discover that God had abundantly supplied everything you needed to sustain your life â€“ â€œA state of Perfect freedomâ€. Another English writer, William Blackstone , â€œFather of the Legal professionâ€, wrote of this Law of Nature in â€œCommentariesâ€. Blackstone continues to define another set of laws â€“ â€œRevealed Lawâ€. Blackstone makes the point that â€œNatural Lawâ€ and â€œRevealed Lawâ€ will never be in conflict, because they come from the same source (God). One more quote from John Locke, that our forefathers understood well. This is a time for every American to set aside bickering and pride. Each of us has a different task to perform in defense of our corporate liberty. No doubt, each task will come with a price. One requiring a change in priorities. There is no place on the fence. Choose your side and prepare to battle for the soul of America.